On 2 November 2017, Bill 149, the Act to enhance the Québec Pension Plan and to amend various retirement-related legislative provisions , was introduced in the National Assembly. 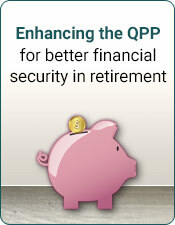 The bill was assented to in February 2018.
strengthen Québec Pension Plan funding. The changes, which will gradually come into effect between 2019 and 2025, will improve the income of future retirees while maintaining intergenerational fairness. Individuals who are already receiving a retirement, disability or surviving spouse's pension, will not be affected by the changes to the Québec Pension Plan. The amount of any pensions already being paid will not change, but will continue to be indexed each year.